As men and women look up at their mirror at a receding hair line, or look down at their comb at broken hair, the question of how to cure hair loss is an obvious one to ask. However before opting for prescription drugs and any invasive solutions for hair loss, consider a natural hair loss remedy. Sometimes small lifestyle changes or a simple and natural hair loss treatment may be all that is required for solving the problem. 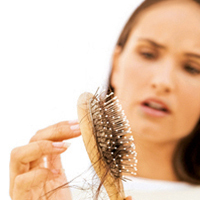 Controlling Stress – A lot of hair loss is related to stress, since stress can literally cause you to lose hair. Controlling stress by better time management, and prioritizing one’s daily schedule, sorting out relationship issues and improving one’s professional situation can help to reduce stress and this will bring about an automatic improvement in the hair loss problem. What can also be helpful is taking up meditation or yoga or just learning breathing exercises because these are naturally useful for lowering stress and enhancing relaxation. Dietary Changes – They say that we are what we eat. The same applies to the hair. Eating healthy is not only good for a strong, healthy body, and great skin, it is also good for the hair. Eating plenty of fresh fruit, leafy green vegetables and nutrient rich food, and cutting out high fat, high sodium and high sugar foods that are processed and have preservatives and other artificial additives is good for the entire body, not just for the hair. Improving Blood Circulation – Having a sedentary or inactive lifestyle can mean poor blood circulation in the body and consequently various physical problems. Taking up exercise can greatly help in improving blood circulation, enhance immunity and also general well being apart from being good for addressing hair loss. Another way to improve blood circulation and help supply oxygen to the hair follicles, is head massage. Many traditionalists believe that an oil massage is best since it delivers vital nutrients to the scalp helping the hair to grow while also conditioning it. However even other, non oily head massages are good for the hair since they stimulate the follicles to produce hair and also improve blood circulation. Taking a Vitamin Supplement – Sometimes nutrient deficiencies in the body may not be able to be addressed by good diet and dietary supplements such as multivitamins and so on may be required. Vitamin B 6 and folic acid can often prove to be effective in controlling hair loss. Addressing Scalp Disorders and Health Problems – If there is a skin ailment or infection that is the root cause of hair loss, this should be addressed; the hair loss will be curtailed on its own. Certain chronic illnesses also contribute to falling hair, as do certain conditions, so effectively treating these will take care of the hair loss automatically. Sarika is a proponent of natural home remedies and alternative treatments to solve common health problems and conditions. These do not cause harmful side effects. Read about home remedies and recipes for dandruff and hair loss treatmenton her website.